Is the pen is mightier than the keyboard ? My name is jackspratt823 and I am an addict. Not whisky, not horses, not drugs. It’s something far more powerful, far more irresistible than any of those. Can’t get enough of them. Like all addictions, the root of the problem goes back to my childhood. When I was at primary school we had these dip pens- dreadful things- like cocktail stick with a bent nail at the end to act as a nib. 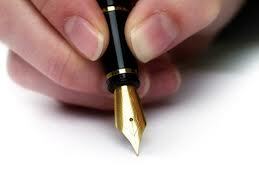 But then I got my first fountain pen- a Conway Stewart Dinky- and I was hooked. I like the clever machinery inside- the little plastic balloon that sucked up the ink from the bottle, and the lovely, liquid line which streamed on to the paper. It was love at first sight. Why bother ? Why not type it out on your computer/phone/tablet/hairbrush ? It’s the physicality of the act ot writing which appeals. Your ideas and intentions flow down your arm and into your fingers and onto the paper. It’s real. Typing on a keyboard is a more abstract process. Your ideas are turned into a string of binaries ( I suppose) and appear on the screen in clusters of dots which look like letters. Somehow, there’s a gap between what you’re thinking and what appears on the screen. Don’t get me wrong- I love the flexibility which word processing brings- the ability to cut and paste, the ability to organise an argument clearly. That’s brilliant. But I hate predictive text- that is creepy- you type something and some strange entity in the machine decides that you’re not allowed to say that. I’ve never heard of a fountain pen running amok. And word processing speeds up the way you write. I always type medium to long pieces. Which brings me to consider what writers did before the invention of the typewriter ( mechanical w/p) and the personal computer. They wrote it all out. By hand. Take Charles Dickens. Most modern novels run to about 60k words. A Dickens novel is, say, three or four times as long. Maybe 250,000 words. How many bottles of ink did he get through a week ? Did he write at night ? If so, what was the candle bill ? Did he get a sore wrist ? Consider the motivation he must have had to put himself through what was a considerable ordeal. And what goes for Dickens, goes for all the pre-19C writers. Tell me about the ways you use to transport those ideas down the arm and into the internet. on The Road not Taken. was an ace with the iron. he looked like Childe Harold. The internet died. I fired up the iBook as usual. Nothing. So I went to the little diagnosis thingy. Three greens. “Houston, we are go for launch.” Then I saw the two lights that Houston are responsible for. They were a menacing red. That meant I had to talk to Cheerful Lady.. I’d talked to her before. I have to talk to her every time the internet dies. This was the second time in a month. Cheerful Lady has a voice like a dental drill and a touching, but spurious, tone which suggests that there are cohorts of engineers, ready to stride into battle on my behalf. Then I listened to the scratchy rendition of Vivaldi”s Four Seasons for five minutes, until…damn ! I’d forgotten.. I scrabbled in my desk to find the tattered cribsheet where all my passwords are written down…Why did I have a password for a petfood company ? Why was it “bonzodog” ? When I went back to the phone Cheerful Lady had hung up, which was sad because her call was really important to me. I re-dialled ,went through the voicemail tree all over again, and ended up talking to someone who sounded suspiciously like a real human being. I suddenly saw the internet as a huge Victorian railway tunnel, with a horde of sturdy navvies in waistcoats and flat caps, hurrying into the darkness to remove a wagon loaded with offers to increase the size of your bank balance, or a part of your anatomy. “ Sir…would you like a discount on your next bill ? All my irritation faded in a moment. He was a real human being, all right- dealing with the fifty seventh old buffer who’d phoned to complain in the last hour. I’m going to post this now- quickly- before the impediment returns.